Liz is a proud member of the Consecrated class of 2009. In her current role as Assistant Director of Alumni Relations, you can find her organizing a binder full of information for Reunion, posting on the alumni Facebook page, meeting and greeting amazing alumni at events, and wearing matching purple outfits with Lisa Harper (the Director of Alumni Relations). 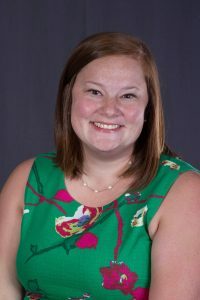 Her favorite part about working with Asbury’s alumni is watching them make connections with each other through Reunion, Alumni Board meetings, regional events or running into someone on campus. Even if they have nothing in common besides being an Asburian, there is a strong connection and she loves the way the Lord uses that bit of community to bring encouragement. When she’s not at work, Liz enjoys volunteering in student ministries at her church, watching re-runs of Fixer Upper, or going on road trips with her roommate.